I hate cycling in the rain; in fact I hate doing anything in the rain. 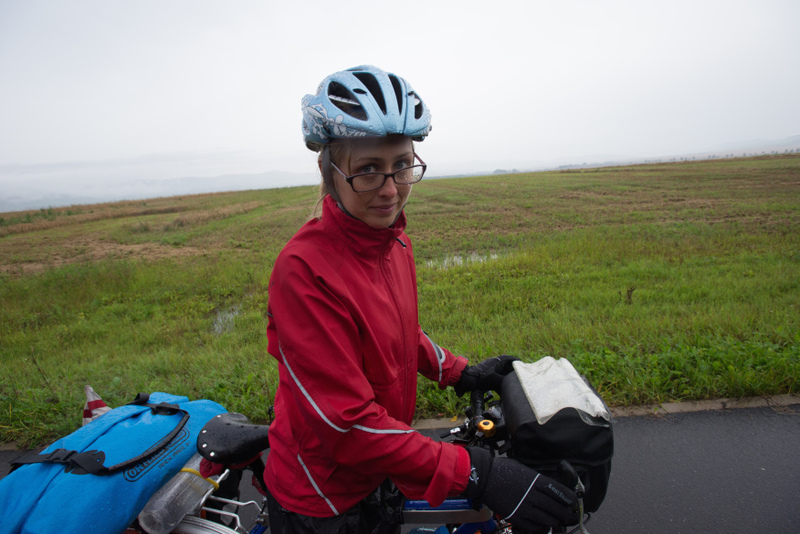 However, when planning for this cycle tour I realised it was something I was going to have to deal with– I wouldn’t always be able to curl up under a blanket and avoid it. With this in mind we decided to contact Sealskinz to ask if they would sponsor us. They have an excellent reputation for keeping cyclists warm and dry in even the wettest of conditions. They kindly offered us our pick of four of their products each. Below is a review of the items we chose and have been using for the past four months. I have to confess that when André first showed me his hat and tried it on, I laughed – a lot! It is not the most stylish of hats and in my opinion you look a little like an Aussie who is trying to find his way back to the outback; it is just missing the dangling corks. However, the last laugh has been on me, as my waterproof jacket has no hood (despite stating on the website that it did) so I have been the one wearing the hat whenever the weather has turned bad. 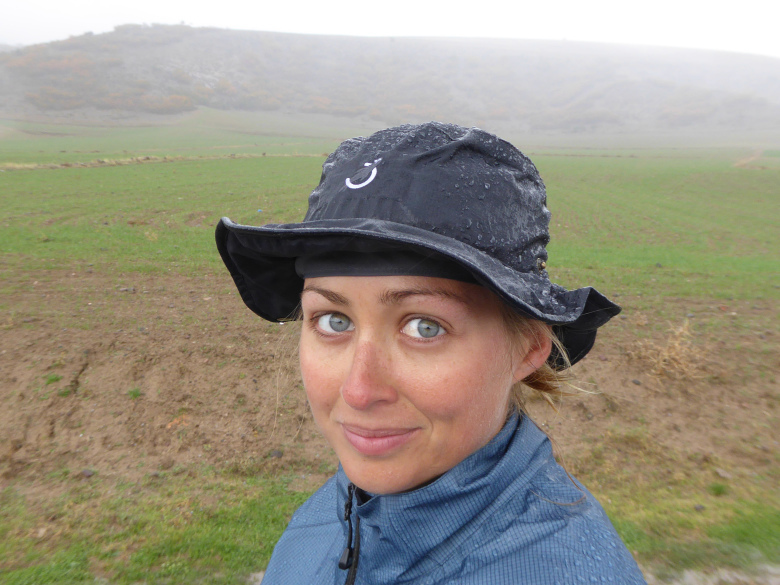 Despite my opinion on the hat as a fashion accessory it performs really well and has saved me from a soaking on many occasions. The hat has a thermal rating of 3 out of 5, which Sealskinz describes as the perfect balance between warmth and breathability. It is also totally waterproof and windproof. 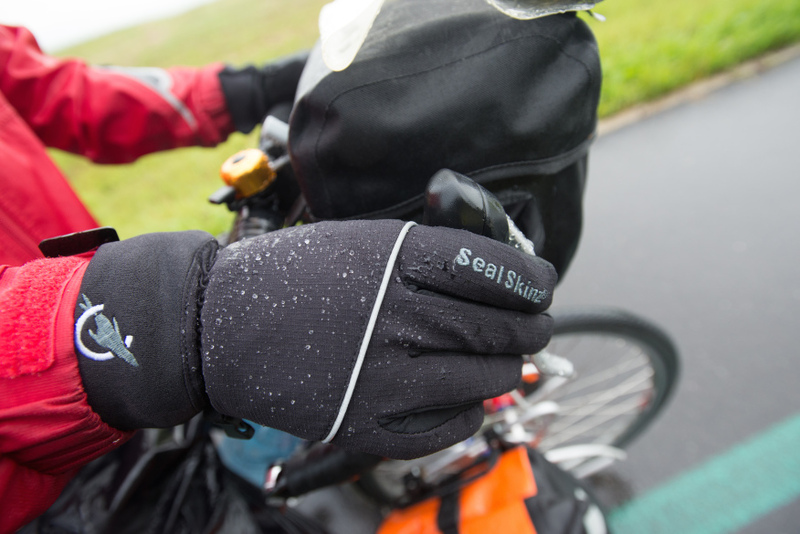 Sealskinz uses an Aqua Dynamic Design hydrophilic membrane, which prevents water getting in, but allows smaller sweat droplets out. This allows the hat to be both waterproof and breathable – the perfect combination for cycling in the rain, as there is nothing worse than feeling sweaty in waterproofs. Another feature that is great is the mesh-lined interior of that hat which makes it very comfortable to wear. In addition to solely keeping your head dry, the brim keeps the rain from running down the back of your neck and from dripping on your face too – which makes for a much more pleasant riding experience. The brim is also useful in the summer as it works really well at protecting your face and neck from the blazing sun, which can be a real problem when you are out riding all day. However, one of André’s main beefs with the hat was the brim. He found it to small, and too floppy. When the wind would whip up or when descending, the hat brim would flap up rendering the protection of the brim useless. This hat has proved itself invaluable on many occasions when it has been lashing down with rain and I really can’t recommend it enough. One slight issue for cyclists is the fact that it can’t really be worn in combination with a helmet. 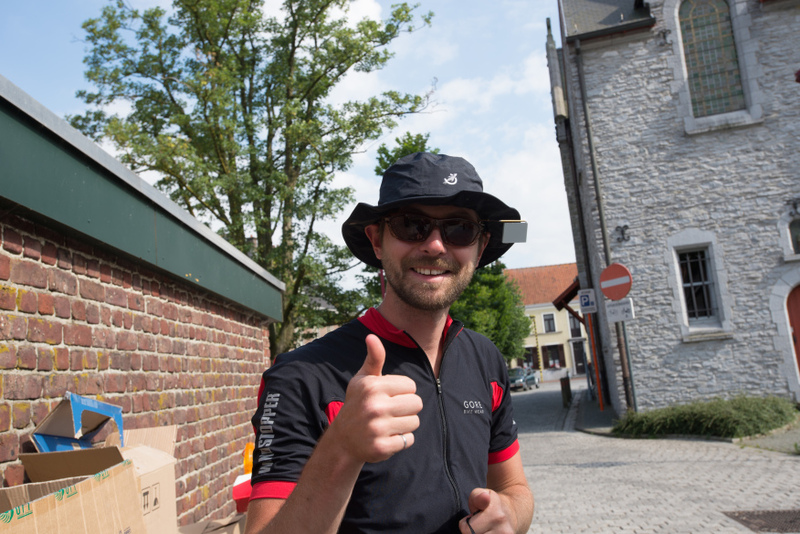 However, Sealskinz never really advertised this hat as one for cyclists and they do offer a range of cycling-specific caps, but none of them come with the all round brim! As an unfortunate ending to this review it has to be mentioned that I will no longer be able to wear my hat as both André and I recently had our bags rifled through and the hat was one of the many items that was stolen. I was very sad to discover it missing as cycling in winter through the ‘Stans will be much harder now. Until recently we have been lucky enough with the weather that these oversocks had never even been taken out of our panniers. 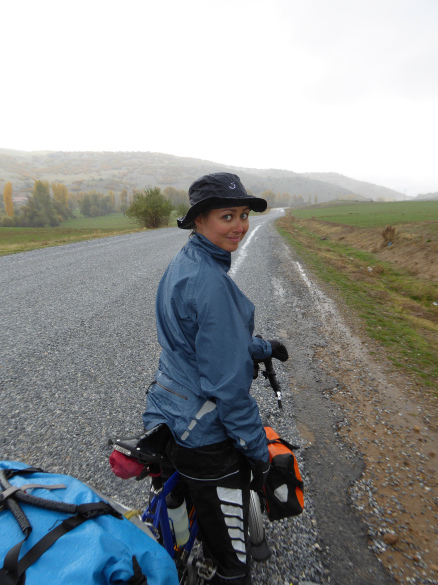 However, during the last couple of weeks in Turkey we cycled through the mountains and we encountered a lot of rain (and some snow! ), so the oversocks got their first outing. In addition to it being wet it was also pretty cold and my toes were feeling very frosty. My cycling shoes have mesh over the toes which is great for ventilation but when it is wet and cold this is a real negative feature. Therefore the cycle oversocks are great as they add a layer of protection against the wet and the cold for my feet. I was wearing the cycle oversocks in conjunction with my sealskinz waterproof socks (read about the review of the socks here) and it was fantastic, it rained constantly all day but my feet stayed dry! The oversocks fit over your shoes leaving a gap for the cleats and the heel. They are totally waterproof, windproof and they are made of a high stretch material (65% Nylon, 35% Elastane), which makes them easy to put on over your shoes and also remove. A couple of slight points to mention include that my oversocks seemed to ride up at the back so that the heel would be exposed, this wasn’t really a major issue as this area didn’t need protecting as much as the front of the shoe but it was a little irritating. Also we wore the oversocks for several days in a row and at the end of these few days we noticed some wear and tear on the oversocks, particularly at the bottom near the sole of the shoe. We think this was caused by us forgetting to take the oversocks off when we dismounted from the bike and were walking around. To be fair the oversocks are obviously not designed to be left on the shoes when walking around. 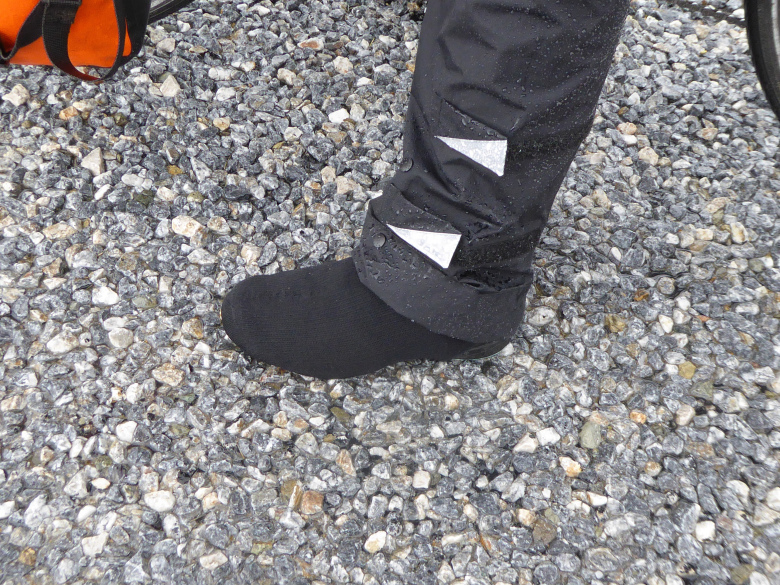 Also the overshoes seem to be designed for racing style shoes, with large cleats and heels (i.e. walking around in racing shoes would not trash the oversock). However, it is worth considering that you will need to always remember to take them off after dismounting which can be a bit annoying especially if they are soaking wet and you are cycle touring so regularly stopping and getting off the bike, as opposed to going for a short bike ride or commuting to work. 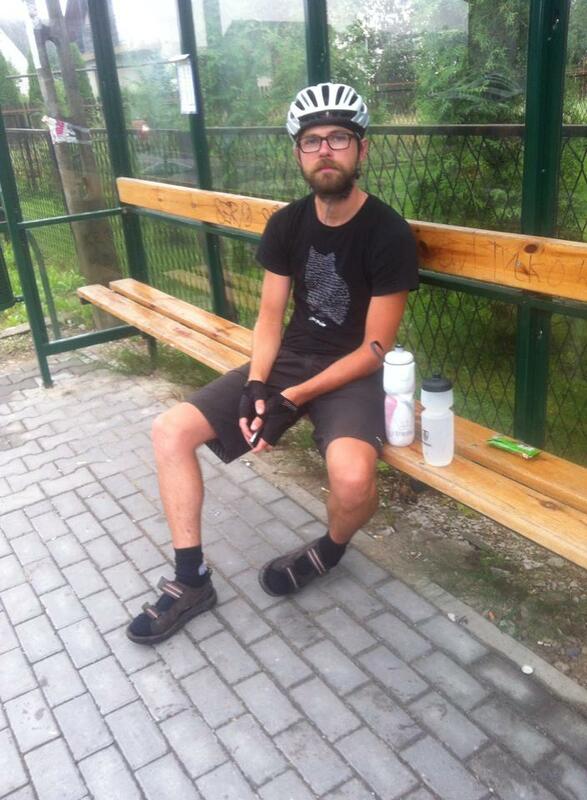 Perhaps for cycle tourers the overshoes that Sealskinz produce are a better option. Unfortunately my oversocks were also stolen from my pannier, André still has his, but mine were taken along with the waterproof hat. Very sad news. I have a pair of the ladies winter cycle gloves and André has the men’s extra cold winter gloves. Of all the items I received from Sealskinz these gloves are my favourite, I don’t have a bad word to say about them. Every time I have worn my gloves I have been impressed by how comfy they are, how incredibly warm and the fact they are completely waterproof. They transform my cycling experience in the cold and wet from a miserable one, to one that is much more bearable! The gloves have a thermal rating of 4 out of 5, whereas Andre’s have a thermal rating of 5. Sealskinz state that thermal ratings of both 4 and 5 are ‘for those times when you expose yourself to extremes in temperature and push yourself to the limit’. 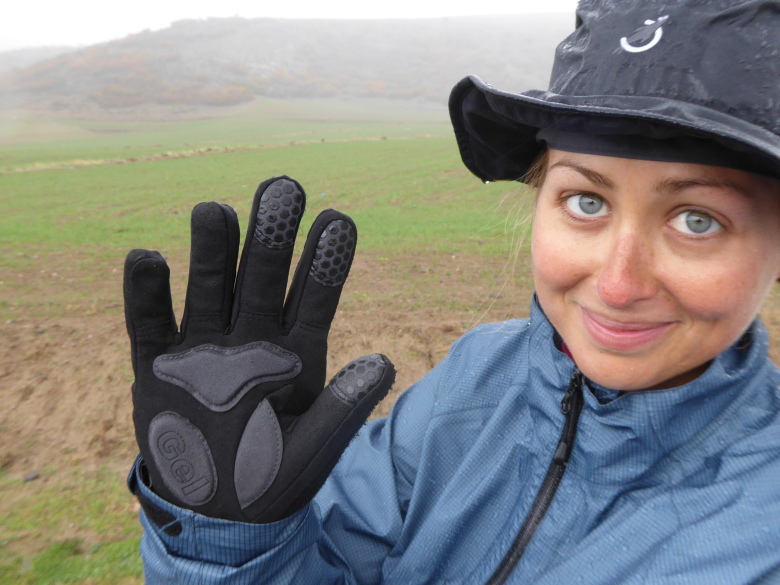 Cycling in the mountains of Turkey was certainly pretty cold but I am not sure we have hit sub-zero temperatures yet so the gloves may not have been tested to their limits, however, we have yet to have even slightly cold or damp hands whilst wearing these gloves. 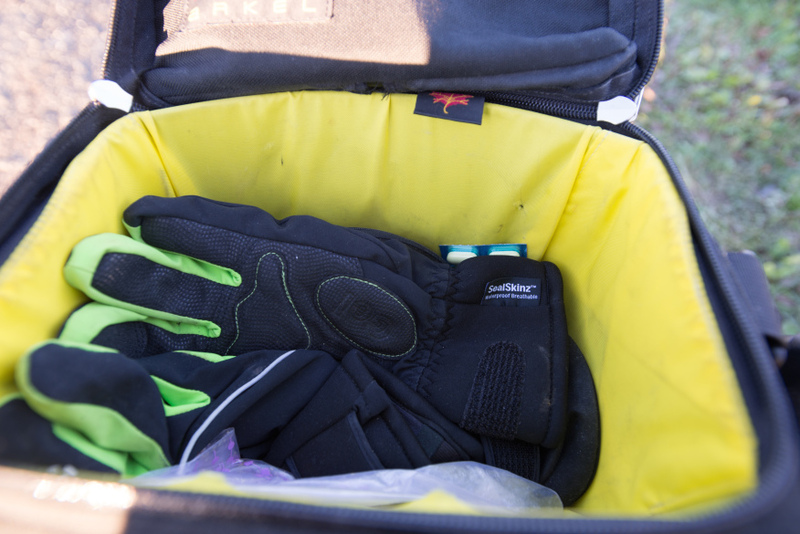 Both pairs of gloves have a fleece-lined interior, which makes them very soft and comfortable to wear. They also both have gel padding on the palms to increase grip and comfort, which is great when on the handlebars all day. Although André’s gloves don’t have as much gel padding as mine. In addition, my gloves have a textured thumb and forefinger so that you can use a touch screen whilst wearing the gloves, this is a very valuable feature as we use our iphones a lot for navigating whilst cycling and I appreciate not having to remove my gloves every time I use the phone. Andre’s gloves don’t have this feature and it is something he is very jealous of. And finally my gloves also have a patch of fleece/towel material on the back of the thumb, this is perfectly positioned for wiping water out of your eyes, or off your face, or actually what it is used mostly for is wiping my dripping nose as I am descending down a mountain! André’s biggest complaint about his gloves is that his fleece wiping section is smaller and is not the entire length of the back of the thumb and that the material is not towel/fleece like but rather like a travel towel and made of microfibre instead which isn’t as good at wiping! To summarise, we feel the winter gloves are the better option and a little bit cheaper than the extra cold winter gloves, they are excellent value for money. We have yet to test out the gloves in sub-zero temperatures so are aware that this might be where the extra winter gloves really come into their own. However, for attention to detail we prefer the winter ones and would highly recommend them to anyone spending lots of time in the great outdoors. Sealskinz do a variety of waterproof socks in different lengths and thicknesses for all conditions. The pair we both chose to get were the thin ankle length socks, I think we had summer showers in mind, however, with hindsight I would buy thicker ones to better cope with the cold mountain passes. The thin ankle-length socks are stated as having minimal insulation and maximum breathability and have a thermal rating of 2 out of 5. Which means they offer lightweight protection for hot and wet climates. On a couple of occasions when cycling on particularly cold days I have worn the socks over the top of another pair of merino wool socks as my feet were cold! The socks themselves are fantastic, completely waterproof and after a full day of cycling in constant rain my feet were still dry. We were both a little skeptical at first about waterproof socks and how they would feel wearing them. We had visions of our feet sweating inside uncomfortable bin liners, and the first time we wore them they did feel a little strange and stiff. However, by the second time we were completely sold! They are very comfortable as they have a merino wool lining and they are produced using Sealskinz Aqua Dynamic Design StretchDry patent. This basically means that they have gone above and beyond the normal design of a hydrophilic membrane by making the membrane stretchable.This means that the socks we are wearing are not only waterproof and breathable but they also fit really closely to our feet, making them more comfortable! 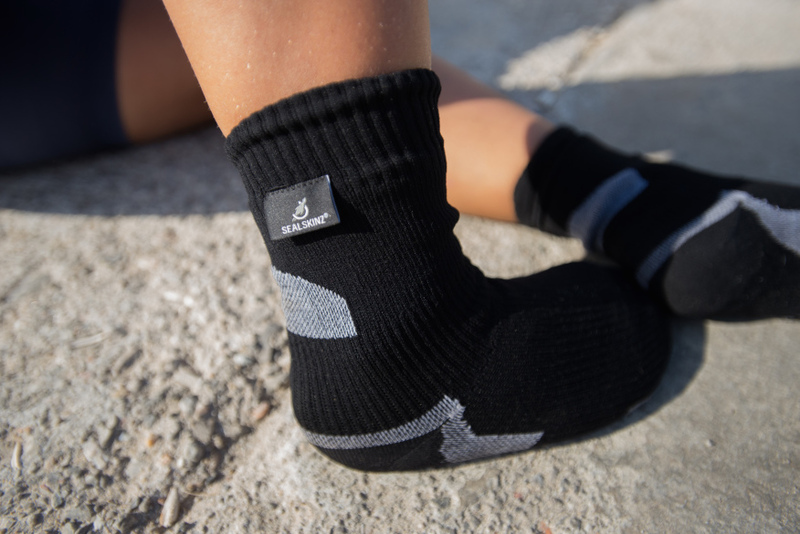 We are huge fans of the waterproof socks and feel like they have revolutionised our cycling experience; having wet feet is a horrible feeling, especially when you are cycling all day. We even wore the waterproof socks with our sandals during summer rain showers. The only time we feel socks and sandals are acceptable!